How Has Cap-and-Trade Functioned So Far? Cap-and-trade is an important component of the state’s overall emission reduction efforts. 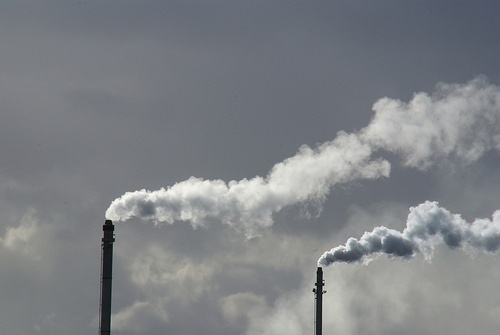 How do emission reduction goals translate into the Real World? AB 32 commits California to reduce statewide emissions to 1990 levels by 2020, and subsequent state laws and executive orders seek to reduce overall emissions by 80% by 2050. California’s Air Resources Board (ARB) calculates this goal as a mandate to reduce total emissions from projected business-as-usual emissions, and recalculates these numbers periodically (presently using a 18% total reduction). Note that this is a moving target, as ARB updates its projections of business-as-usual to respond to population, technological, and economic changes. ARB is to accomplish as many of these required reductions as possible through regulations targeted to categories of stationary sources of GHG emissions, and to motor vehicles and their fuels. Other state agencies also cooperate with regulations within their areas of authority, such as Integrated Waste Management Board controls on solid waste facilities. Beginning in 2007, agencies have adopted several dozen sets of rules, which ARB projects will achieve over 60% of the reductions necessary to reach the 2020 goal – leaving 22.8 million tons of CO2-equivalent (MMTCO2e) unaccounted for. - Operators of facilities in specific high-emission sectors (including cement plants, petroleum refineries and self-generation facilities), with facility-wide emissions more than 25,000 tons of CO2 equivalent (TCO2e) per year from combustion and process emissions. - First deliverers of electricity. - Suppliers of natural gas, fuels and CO2 (beginning in 2015). This program covers about 450 businesses (including nearly 700 facilities, 52 fuel suppliers, and 64 electricity importers), which ARB calculates produce 85% of the state’s GHG emissions. ARB has allocated emission allowances based on 2012 emissions, declining through 2020 (2% per year in phase 2013-14 and 3% per year thereafter). Detailed rules are used to assign emissions to sectors and individual entities. Most allowances (including those to electric utilities) are initially free, although more become subject to competitive auctions over time. Most emission allowances are sold at quarterly auctions, at which ARB sets the numbers available, the year covered by each (“vintage”), and the minimum price at which bids may be accepted. The auction mechanism has been considered a success, although bids have declined in the last year, due at least partly to the anticipated expiration of the program that has now been postponed. Auctions have raised roughly $3.4 billion, which have been allocated through legislative formulae to a range of projects in low-carbon transportation, sustainable communities, clean energy and energy efficiency, and natural resources and waste diversion. The state’s Chamber of Commerce sued, seeking to invalidate the cap-and-trade program by claiming it amounts to a “tax”, adopted in violation of California’s requirement that a two-thirds vote of the legislature is required to adopt a tax. The California Supreme Court rejected this argument in June 2017, but the dispute continues to affect discussions of cap-and-trade. AB 32 also allow regulated entities to create or acquire offsets (up to 8% of their compliance obligation), which can be met from within the regulated community or from outsiders that meet conditions to opt-in. As of this writing, ARB has adopted offset protocols that may be used to generate ARB offset credits by qualifying projects involving forests and urban forests, livestock, ozone depleting substance reductions, and mining. The program is designed to link with similar trading programs in other states and regions. It has been linked to Quebec’s provincial program since 2014, and additional linkages are under development. What Changes are Being Adopted Along With the Program Extension? - Extends the cap-and-trade program through December 31, 2030. - Directs ARB to update its Scoping Plan for implementation of all AB 32 provisions (as amended) including extension through 2030. - Revises auction provisions to direct ARB to set price ceilings at auctions, in addition to price floors. - Limits each regulated entity’s use of offsets to 4% of emissions during 2021-2025 and 6% during 2026-2030, and requires that at least half of any offsets applied be from projects located within California. - Restricts local air districts’ authority to adopt direct controls on CO2 emissions from sources already subject to cap-and-trade. - Suspends until 2030 an unrelated fire prevention fee assessed on landowners in rural areas (to secure votes from rural legislators). - Extends and expands existing tax credits for manufacturers (to secure votes from pro-business legislators). Second, a separate bill (AB 617, Garcia) expands air quality efforts targeted at “community health” impacts, including enhanced monitoring to quantify localized hot spots with higher concentrations of conventional and toxic air pollutants, and agency plans to address such hot spots. These changes address some urban legislators’ concerns that these hot spots are being neglected, and that GHG offsets tend to allow major sources in urbanized areas (such as oil refineries) to continue their emissions by purchasing reductions from projects in distant less-polluted areas. This bill also raises civil and criminal penalties for a variety of violations of air quality requirements. Third, legislators approved a proposed amendment to the state constitution (ACA 1) that will be presented to the voters as a state ballot proposition, under which money collected from allowance auctions will be assigned to a new state spending account and require a 2/3 vote of the legislature to appropriate. This mechanism is intended to allow the minority party (presently Republicans) an important role in these spending decisions. Is my organization subject to California’s cap-and-trade program? Did it sell or purchase allowances? Is it preparing to sell or purchase allowances in future auctions? Is my organization outside California, but in a sector subject to California’s program? Has it considered effects on its market and competitors? Is my organization considering investing in projects that might qualify to sell offsets to entities in California or other jurisdictions?